How they've changed the hobby! Without doubt electric rc airplanes (Electric Power or 'EP') have been responsible for bringing a huge number of people in to the radio control flying hobby in recent years, and it's easy to see why. When I started creating this website back in 2002, Ready To Fly ('RTF') electric planes were only just becoming readily available and affordable. Just a few companies were mass-producing them, mostly from foam, and traditional builders probably saw them as a flash-in-the pan novelty! But electric power had truly arrived and the relative low cost and convenience of EP bundled in to an all-in-one package proved irresistible to the beginner. At the time it was hard to imagine just how popular RTF EP planes would become, but with hindsight it's not at all surprising. Now, of course, it's mainstream throughout the hobby. Manufacturers quickly recognised a keen market and it didn't take long for RTF electric planes such as the now-famous HobbyZone Super Cub to become established products in the hobby. The Super Cub LP , above left, and the Apprentice 15e , two very popular electric rc trainers and solid benchmarks in EP flight. Incidentally, foam construction has become the industry standard material for electric RTF planes, although of course traditional balsa/ply model planes are widely available as kits and in ARF form, and to a lesser degree in RTF form. Indeed it's fair to say that foam RTF EP rc airplanes (man that's a lot of abbreviations! ) have flooded the market since their introduction, forcing traditionally built planes to take a back seat. The quality of such electric rc planes has improved dramatically to the point where mass-produced scale foam airplanes, like warbirds for example, are nearly as impressive as a scratch built one made by an experienced modeller over many months. And they can be bought for a much lesser cost, too. 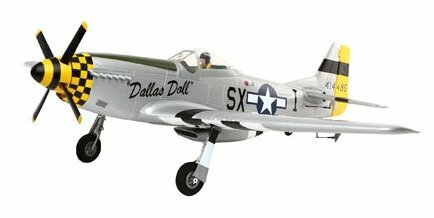 The North American P-51 Mustang is an example that's been modelled on a huge scale and is probably one of the most popular scale electric planes out there. Shown below is an example from E-flite, although this particular one isn't RTF. and perfect candidates for an rc airplane sound system. It's a good reflection of how the top manufacturers have really raised their game, and brands like HobbyZone and E-flite (along with ParkZone) are big names in EP flight these days; HobbyZone being aimed at the complete beginner with their foamie range while E-flite target the more experienced flyer with a mix of foam and balsa electric aircraft. Of course, there are numerous other great manufacturers churning out electric planes, such as Multiplex, Art-Tech, FreeWing and Great Planes to name a few. EP planes from such brand names offer great value and have brought countless people in to the radio control flying hobby; people who probably wouldn't have bothered if IC power (internal combustion) was the only option. In the very early days of EP (pre mass-production), electric rc airplanes were underpowered. Brushed motors and gearboxes were the order of the day, along with heavy nickel-cadmium batteries. It all made for a pretty poor powertrain setup, resulting in poor flight performance. Thankfully those days are gone and EP planes are now at the point where they can match - even exceed - an IC powered plane in terms of flight times and performance. As a case in point, members of the UK RC Aerobatic Team have mostly swapped to electric power now! Electric power in the radio control flying hobby has exceeded all expectations, there's no doubt about that. Such is the popularity of electric power now, some manufacturers have even taken their most popular IC trainers and converted them to electric Ready To Fly planes. Several favourite 4-channel RTF glow powered trainers became available as electric versions, two examples being the E-flite Alpha 450 and the HobbiCo NexStar Select EP, although both are now discontinued. Both these planes had similar performance to their IC cousins. were reborn with electric power. But not only are manufacturers producing IC-equivalent electric planes, aeromodellers are converting IC planes themselves. Pictured right is my own 60" span Edge 540 intended to take an IC engine, but I converted it to electric power. This kind of EP conversion is very commonplace now, and again it just goes to show how much the hobby has progressed in recent years. Roll the clock back just a few years and converting such a plane to realistic electric power would have been a real struggle, and very expensive. Electric power has, as previously mentioned, transformed this hobby and the ongoing electronic revolution has resulted in smaller and smaller rc planes being produced. Generally speaking, bigger is better when learning to fly rc (up to a point...) but today's micro rc planes have made a huge impact on the hobby. 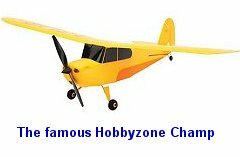 One of the most popular planes for learning on has been the HobbyZone Champ which has sold in its thousands. The Champ, pictured right, is a 3-channel plane with just a 16 inch wingspan. Although now a bit dated, in terms of micro rc planes, it still continues to sell well and introduce new flyers to the hobby. If your budget is tight and your flying space limited in size, it's certainly one to consider! The E-flite UMX range of micro electric rc planes is very impressive and many feature Horizon Hobby's trademark auto-stabilisation technology, AS3X™. This greatly reduces the inherent twitchiness of smaller planes (less mass makes them more susceptible to wind gusts etc. ), making them handle more like larger planes in terms of stability. 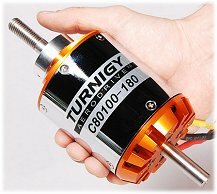 At the other end of the scale, electric motors can be bought large enough to power huge scale rc planes, so there really is no limit to what can be achieved with electric power in the rc flying hobby these days. Imagine how big the plane needs to be to use an electric motor like this one shown! With so many EP planes available nowadays, choosing a suitable model does need some consideration. Fortunately the process of selecting the right plane for your needs can be kept simple so long as you keep a few basic guidelines in mind. Many RTF electric planes are designed for the beginner, but there are also many that are not. Planes that are of a high wing design (i.e. the wing sits on top of the fuselage) always make the best ones to learn on because of their natural stability in the air. Typically these are trainers which you can read about here. An alternative to this design which is also beginner-friendly is the rc powered glider. An RTF (Ready To Fly) airplane is far better if you have no modelling experience; it's the best way of getting airborne with the least amount of frustration. More about RTFs here. Size matters! A plane with a wingspan of between 30 and 50 inches is the optimum size for learning. Much smaller and you'll have trouble seeing what it's doing, much bigger and it could be too much of a handful. That said, micro-size planes do have their place for beginners, especially if you're limited with your flying area size and/or budget. Check out availability of spare parts before you buy - you will need them at some time or another. A proper replacement part is a safer option than a bodged repair. 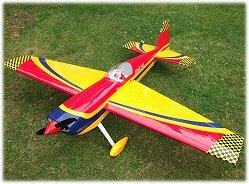 Choose an rc plane that is durable and easily repairable after minor damage; for example, foam planes are tougher and easier to repair than balsa wood ones. Be aware of who you're buying from - with the increased popularity of the hobby in recent years comes the increase of unscrupulous sellers who are only interested in your money rather than your success in and enjoyment of your new hobby. Number of channels is important. The common options are 3 or 4, with 2-channel planes being more toy planes than anything else. A channel is a controllable function of the plane, and essentially 3-channels makes learning easier, but 4 gives you more fun. You can read more about rc airplane controls here. Do research. Internet forums and video sites are great places to seek further advice, or ask at your local hobby shop, or club, if you have one. The above pointers only scratch the surface, but my e-book The Beginner's Guide To Flying RC Airplanes will answer all the questions you have about getting started in radio control flying with an electric plane. Well hopefully this page has introduced you to EP within the hobby. Learning to fly an electric rc plane is a fun and exhilarating experience but you do need to simplify the game as much as possible in your early days. Keeping the above points in mind should help you do that, and once you've got a few hours flying under your hat and built up some confidence then you can consider moving on to larger and faster planes. My Beginner's Guide To Flying RC Airplanes e-book will take you step-by-step all the way! The Beginner's Guide To Flying RC Airplanes. Learn to fly rc planes. How to fly rc planes. Gas vs. electric rc flying. The Watts per pound rule.